When your child experiences a nosebleed, actually seeing the blood can often be more traumatizing than the bleeding itself. Since nose bleeds, medically known as epistaxis, are typically mild and not painful, quickly going to work to stop the nosebleed so your child can return to normal activities is best. In very rare cases, chronic sudden nosebleeds can be the sign of a medical issue, so consult with your child's physician. Inside the nose are capillaries -- tiny tubes -- filled with blood. When those capillaries become inflamed and then pressure is applied, they can burst, resulting in a nosebleed. Inflamed capillaries and subsequent nosebleeds occur for a number of reasons, including dry air, blood rushing to the face, a blow to the area around the nose or suffering from a common cold. Since children are susceptible to colds or facial injuries and have more delicate nasal capillaries than adults, they are more likely to get a nosebleed. If your child has a nosebleed, immediately gently cover the end of the nose with a tissue, pinch the nose at the bridge, and lean your child forward. Leaning backward could cause your child to swallow some of the blood. While it may seem like your child is losing excessive blood, the typical nosebleed releases only a few teaspoons, according to BBC Health. Calming your child will not only comfort him, it can prevent crying from further exacerbating the problem by causing blood to rush to the face. Sit quietly for 10 minutes and avoid checking the nose to see if bleeding has stopped; allow a clot to form in the nose, and have your child participate in a calm and quiet activity for a few hours following the bleed. Taking the proper precautions can limit your child's chance of having a nosebleed. Some children have more delicate capillaries and are therefore more prone to getting sudden nosebleeds. By keeping the air in your home moist, you can help stop dried capillaries from becoming even more delicate. A humidifier in you child's bedroom can help. Applying petroleum jelly inside the nostrils before bed can also help keep the area moist and less delicate. Also always ensure your child wears the proper facial protection when playing sports, and discourage your child from picking his nose. In rare cases, frequent, sudden nosebleeds can be a symptom of a serious blood-clotting disorder. If you can't stop the bleeding on your own after 10 to 20 minutes and your child begins to feel weak or woozy, get medical advice immediately. 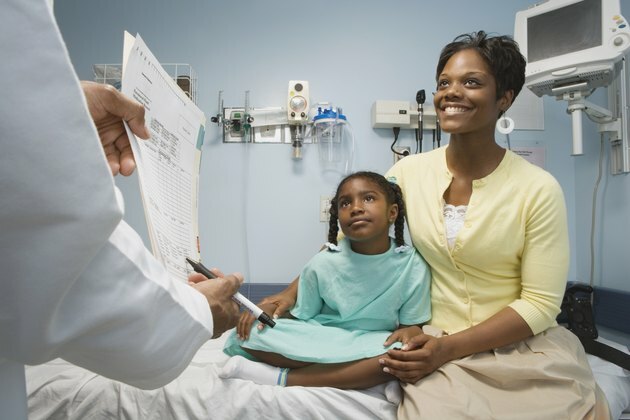 Your child's doctor may need to freeze or burn the blood vessels, known as cauterization, to stop the bleeding. Ointment may also need to be applied to stop infection. Your doctor may also need to test your child's blood to ensure her white blood cell counts are adequate to rule out a clotting disorder. Princeton Online; Spontaneous Epistaxis (Nosebleeds) in Children ; Mark B. Levin, et al.